The Most Reverend Peter J. Muldoon, D.D. Peter James Muldoon was born in Columbia, California to Irish immigrants John and Catherine (Coughlin) Muldoon. He was the oldest child in a family of five children. Muldoon was educated at St. Mary’s College in St. Mary, Kentucky and St. Mary’s Seminary, Baltimore, Maryland and ordained a Catholic priest for the Archdiocese of Chicago in 1886. 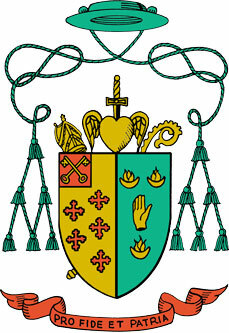 Muldoon served as chancellor and secretary from 1888 to 1895 to Archbishop P. A. Feehan, and became auxiliary bishop to Archbishop Feehan in 1900. He was appointed titular bishop of Tamassus, auxiliary of Chicago, and vicar-general in 1901. 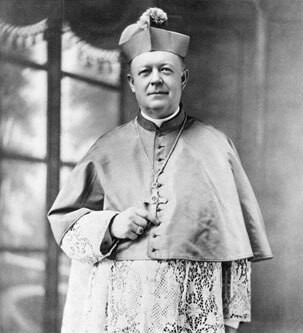 In 1908 he was appointed bishop of the new Diocese of Rockford which had just been separated from the Archdiocese of Chicago. Muldoon played a prominent role in the social reform movement and served as Chairman of the National Catholic War Council; in this role, he became a nationally known figure. He worked closely with members of other religious groups and government agencies; his forcefulness and diplomacy are considered to have contributed to the success of the council. After the war, Muldoon induced Cardinal James Gibbons to propose creation of a peacetime organization comparable to the National Catholic War Council. When the National Catholic Welfare Council was created in 1919, Muldoon was appointed as the episcopal chairman of its Social Action Department. Together with Joseph Schrembs, Patrick Hayes and Bishop William Russell he embraced the concepts expressed in a paper on social reconstruction written by Father John Ryan. The paper, which begun with the sentence “The only safeguard of peace is social justice and a contented people” contained series of proposed social reforms that were quite advanced for the time. They included child labour laws, the creation of public housing for the poor, and a number of others. 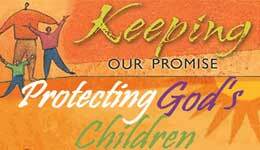 When some American bishops complained to the pope in 1922 about the National Catholic Welfare Council, the original approbation for the council was revoked. Muldoon as well as Bishop Joseph Schrembs of Cleveland were among the most vigorous defenders of the NCWC. After the American hierarchy sent a delegation headed by Shrembs to Rome, the Vatican finally agreed to restore the approbation providing, among other things, that the organization be renamed the National Catholic Welfare Conference. Muldoon died in 1927 after a long illness.